Area Ranked 9th in the U.S.
Population Ranked 27th in the U.S.
i /ˈɔrɪɡən/ OR-ə-gən) is a state in the Pacific Northwest region of the United States. It is located on the Pacific coast, with Washington to the north, California to the south, Nevada on the southeast and Idaho to the east. The Columbia and Snake rivers delineate much of Oregon's northern and eastern boundaries, respectively. The area was inhabited by many indigenous tribes before the arrival of traders, explorers, and settlers who formed an autonomous government in Oregon Country in 1843. The Oregon Territory was created in 1848, and Oregon became the 33rd state on February 14, 1859. Salem is the state's capital and third-most-populous city; Portland is the most populous. Oregon's 2010 population is just over 3.8 million, a 12% increase over 2000. Portland is the 29th-largest U.S. city, with a population of 583,776 (2010 US Census) and a metro population of 2,241,841 (2009 estimate), the 23rd-largest U.S. metro area. The valley of the Willamette River in western Oregon is the state's most densely populated area and is home to eight of the ten most populous cities. Oregon contains a diverse landscape including the windswept Pacific coastline, the volcanoes of the rugged and glaciated Cascade Mountain Range, many waterfalls (including Multnomah Falls), dense evergreen forests, and high desert across much of the eastern portion of the state, extending into the Great Basin. The tall Douglas firs and redwoods along the rainy Western Oregon coast contrast with the lower density and fire prone pine tree and juniper forests covering portions of the eastern half of the state. Stretching east from Central Oregon, the state also includes semi-arid shrublands, prairies, deserts, steppes, and meadows. Mount Hood is the highest point in the state at 11,249 feet (3,429 m). Crater Lake National Park is the only national park in Oregon. Humans have inhabited the area that is now Oregon for at least 15,000 years. In recorded history, mentions of the land date to as early as the 16th century. During the 18th and 19th centuries, European powers—and later the United States—quarreled over possession of the region until 1846 when the U.S. and Great Britain finalized division of the region. Oregon became a state in 1859 and is now home to over 3.8 million residents. The first European explorers were Spanish, during the late 17th Century. Further exploration from Alta California took place during the 18th century. British captain James Cook explored the coast in 1778 in search of the Northwest Passage. French Canadian trappers and missionaries arrived in the eastern part of the state in the late 18th century and early 19th century. The evidence of this can be found in the numerous names of French origin in that part of the state. The Lewis and Clark Expedition traveled through the region also in search of the Northwest Passage. They built their winter fort at Fort Clatsop, near the mouth of the Columbia River. British explorer David Thompson also conducted overland exploration. In 1841, the expert trapper and entrepreneur Ewing Young died leaving considerable wealth and no apparent heir, and no system to probate his estate. A meeting followed Young's funeral at which a probate government was proposed. Doctor Ira Babcock of Jason Lee's Methodist Mission was elected Supreme Judge. Babcock chaired two meetings in 1842 at Champoeg (half way between Lee's mission and Oregon City) to discuss wolves and other animals of contemporary concern. These meetings were precursors to an all-citizen meeting in 1843, which instituted a provisional government headed by an executive committee made up of David Hill, Alanson Beers, and Joseph Gale. This government was the first acting public government of the Oregon Country before annexation by the government of the United States. Oregon welcome sign at Hells Canyon. One theory is the name comes from the French word ouragan ("windstorm" or "hurricane"), which was applied to the River of the West based on Native American tales of powerful Chinook winds of the lower Columbia River, or perhaps from firsthand French experience with the chinook winds of the Great Plains. At the time the River of the West was thought to rise in western Minnesota and flow west through the Great Plains. According to the Oregon Tourism Commission (also known as Travel Oregon), present-day Oregonians /ˌɒrɪˈɡoʊniɪnz/ pronounce the state's name as "OR-UH-GUN, never OR-EE-GONE". After being drafted by the Detroit Lions in 2002, former Oregon Ducks quarterback Joey Harrington distributed "ORYGUN" stickers to members of the media as a reminder of how to pronounce the name of his home state. The stickers are sold by the University of Oregon Bookstore, which credits the spelling as a joke "meant for Oregonians everywhere who get a kick out of this hilarious mispronunciation of our state." Oregon is 295 miles (475 km) north to south at longest distance, and 395 miles (636 km) east to west at longest distance. In land and water area, Oregon is the ninth largest state, covering 98,381 square miles (254,810 km2). The highest point in Oregon is the summit of Mount Hood, at 11,239 feet (3,426 m), and its lowest point is sea level of the Pacific Ocean along the Oregon coast. Its mean elevation is 3,300 feet (1,006 m). Crater Lake National Park is the state's only national park and the site of Crater Lake, the deepest lake in the U.S. at 1,943 feet (592 m). Oregon claims the D River is the shortest river in the world, though the American state of Montana makes the same claim of its Roe River. Oregon is also home to Mill Ends Park (in Portland), the smallest park in the world at 452 square inches (0.29 m2). Oregon's geographical center is farther west than any of the other 48 contiguous states (although the westernmost point of the lower 48 states is in Washington). Nearly half of Oregon's land is held by the U.S. Forest Service and the Bureau of Land Management. Oregon's climate—particularly in the western part of the state—is heavily influenced by the Pacific Ocean. The climate is mild, but periods of extreme hot and cold can affect parts of the state. Oregon's population centers, which lie mostly in the western part of the state, are moist and mild, while the lightly populated high deserts of Central and Eastern Oregon are much drier. Oregon's highest recorded temperature is 119 °F (48 °C) at Pendleton on August 10, 1898 and the lowest recorded temperature is −54 °F (−47.8 °C) at Seneca on February 10, 1933. 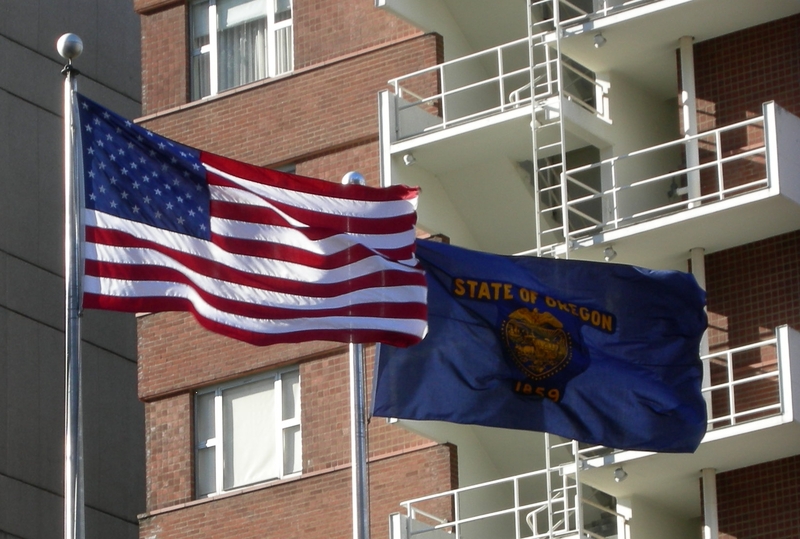 The flags of the United States and Flag of Oregon flown side-by-side in downtown Portland. The debate over whether to move to annual sessions is a long-standing battle in Oregon politics, but the voters have resisted the move from citizen legislators to professional lawmakers. Because Oregon's state budget is written in two year increments and, having no sales tax, its revenue is based largely on income taxes, it is often significantly over- or under-budget. Recent legislatures have had to be called into special session repeatedly to address revenue shortfalls resulting from economic downturns, bringing to a head the need for more frequent legislative sessions. Oregon Initiative 71, passed in 2010, mandates the Legislature to begin meeting every year, for 160 days in odd numbered years, and 35 days in even numbered years. Party registration in Oregon, 1950–2006. Oregonians have voted for the Democratic Presidential candidate in every election since 1988. In 2004 and 2006, Democrats won control of the state Senate and then the House. Since the late 1990s, Oregon has been represented by four Democrats and one Republican in the U.S. House of Representatives. Since 2009, the state has had two Democratic Senators, Ron Wyden and Jeff Merkley. Oregon voters have elected Democratic governors in every election since 1986, most recently electing John Kitzhaber over Republican Chris Dudley in 2010. Like all U.S. states, Oregon is represented by two U.S. Senators. Since the 1980 census, Oregon has had five Congressional districts. The state has been thought of as politically split by the Cascade Range, with western Oregon being liberal and Eastern Oregon being conservative. In a 2008 analysis of the 2004 presidential election, a political analyst found that according to the application of a Likert scale, Oregon boasted both the most liberal voters and the most conservative voters, making it the most politically polarized state in the country. In following years, the primary election to select party candidates was adopted in 1904, and in 1908 the Oregon Constitution was amended to include recall of public officials. More recent amendments include the nation's first doctor-assisted suicide law, called the Death with Dignity law (which was challenged, unsuccessfully, in 2005 by the Bush administration in a case heard by the U.S. Supreme Court), legalization of medical cannabis, and among the nation's strongest anti-urban sprawl and pro-environment laws. More recently, 2004's Measure 37 reflects a backlash against such land use laws. However, a further ballot measure in 2007, Measure 49, curtailed many of the provisions of 37. Oregon pioneered the American use of postal voting, beginning with experimentation approved by the Oregon Legislative Assembly in 1981 and culminating with a 1998 ballot measure mandating that all counties conduct elections by mail. It remains the only state where voting by mail is the only method of voting. Under the leadership of Governor John Kitzhaber in 1994, Oregon was the first state in the US to set up effective health care programs with theOregon Health Plan, which made health care available to most of its citizens without private health insurance. In the U.S. Electoral College, Oregon casts seven votes. Oregon has supported Democratic candidates in the last six elections. Democrat Barack Obama won the state in 2008 by a margin of sixteen percentage points, with over 56% of the popular vote. A grain elevator in Halsey storing grass seed, one of the state's largest crops. The Gross Domestic Product (GDP) of Oregon in 2008 was $161.6 billion, it is the United States's 26th wealthiest state by GDP. The state's per capita personal income in 2008 was $38,801. Land in the Willamette Valley owes its fertility to the Missoula Floods, which deposited lake sediment from Glacial Lake Missoula in western Montana onto the valley floor. Oregon is also one of four major world hazelnut growing regions, and produces 95% of the domestic hazelnuts in the United States. While the history of the wine production in Oregon can be traced to before Prohibition, it became a significant industry beginning in the 1970s. In 2005, Oregon ranked third among U.S. states with 303 wineries. Due to regional similarities in climate and soil, the grapes planted in Oregon are often the same varieties found in the French regions of Alsace and Burgundy. In the Southern Oregon coast commercially cultivated cranberries account for about 7 percent of U.S. production, and the cranberry ranks twenty-third among Oregon's top fifty agricultural commodities. From 2006 to 2008, Oregon growers harvested between forty and forty-nine million pounds of berries every year. Cranberry cultivation in Oregon uses about 27,000 acres in southern Coos and northern Curry counties, centered around the coastal city of Bandon, Oregon. Vast forests have historically made Oregon one of the nation's major timber production and logging states, but forest fires (such as the Tillamook Burn), over-harvesting, and lawsuits over the proper management of the extensive federal forest holdings have reduced the timber produced. According to the Oregon Forest Resources Institute, between 1989 and 2001 the amount of timber harvested from federal lands dropped some 96%, from 4,333 million to 173 million board feet (10,000,000 to 408,000 m3), although harvest levels on private land have remained relatively constant. Even the shift in recent years towards finished goods such as paper and building materials has not slowed the decline of the timber industry in the state. The effects of this decline have included Weyerhaeuser's acquisition of Portland-based Willamette Industries in January 2002, the relocation of Louisiana-Pacific's corporate headquarters from Portland to Nashville, and the decline of former lumber company towns such as Gilchrist. Despite these changes, Oregon still leads the United States in softwood lumber production; in 2001, 6,056 million board feet (14,000,000 m3) was produced in Oregon, compared with 4,257 million board feet (10,050,000 m3) in Washington, 2,731 million board feet (6,444,000 m3) in California, 2,413 million board feet (5,694,000 m3) in Georgia, and 2,327 million board feet (5,491,000 m3) in Mississippi. The slow of the timber and lumber industry has caused high unemployment rates in rural areas. Oregon occasionally hosts film shoots. Movies filmed in Oregon include: Rooster Cogburn, The Goonies, National Lampoon's Animal House, Stand By Me, Kindergarten Cop, Overboard, The River Wild, One Flew Over the Cuckoo's Nest, Paint Your Wagon, The Hunted, Sometimes a Great Notion, Elephant, Bandits, The Ring, The Ring Two, Quarterback Princess, The General, Mr. Brooks, Teenage Mutant Ninja Turtles III, Short Circuit, Come See the Paradise, The Shining, Drugstore Cowboy, My Own Private Idaho, The Postman, Homeward Bound, Free Willy, Free Willy 2: The Adventure Home, 1941, Swordfish, Twilight, Untraceable, Mean Creek, and Wendy and Lucy. Oregon native Matt Groening, creator of The Simpsons, has incorporated many references from his hometown of Portland into the TV series. In late 2008, Hells Canyon and Oregon's badlands were a set location for an episode of Man vs. Wild. The spinoffs and startups that were produced by these two companies led to the establishment in that area of the so-called Silicon Forest. The recession and dot-com bust of 2001 hit the region hard; many high technology employers reduced the number of their employees or went out of business. Open Source Development Labs made news in 2004 when they hired Linus Torvalds, developer of the Linux kernel. Recently, biotechnology giant Genentech purchased several acres of land in Hillsboro to expand its production capabilities. Oregon is home to several large datacenters that take advantage of cheap power and a climate in Central Oregon conducive to reducing cooling costs. Google has a large datacenter in The Dalles; Facebook is building a datacenter in Prineville; and Amazon is restarting construction of a datacenter in Boardman. Oregon is also the home of large corporations in other industries. The world headquarters of Nike, Inc. are located near Beaverton. Medford is home to two of the largest mail order companies in the country: Harry and David Operations Corp., which sells gift items under several brands, and Musician's Friend, an international catalog and Internet retailer of musical instruments and related products. Medford is also home to the national headquarters of the Fortune 1000 company, Lithia Motors. Portland is home to one of the West's largest trade book publishing houses, Graphic Arts Center Publishing. Oregon ranks 4th nationally in craft breweries per capita. Portland reportedly has more strip clubs per capita than Las Vegas or San Francisco. As of April 2011, the state's unemployment rate is 9.5%. Oregon's largest for-profit employer is Intel, located in the Silicon Forest area on Portland's west side. Intel was the largest employer in Oregon until 2008. As of January 2009, the largest employer in Oregon is Providence Health & Services a non-profit. The state also has a minimum corporate tax of only $10 a year, amounting to 5.6% of the General Fund in the 2005–2007 biennium; data about which businesses pay the minimum is not available to the public. As a result, the state relies on property and income taxes for its revenue. Oregon has the fifth highest personal income tax in the nation. According to the U.S. Census Bureau, Oregon ranked 41st out of the 50 states in taxes per capita in 2005. The average paid of $1,791.45 is higher than only nine other states. 55 percent of state revenues are spent on public education, 23% on human services (child protective services, Medicaid, and senior services), 17% on public safety, and 5% on other services. County population cartogram of Oregon. As of the census of 2010, Oregon has a population of 3,831,074, which is an increase of 409,675, or 12%, since the year 2000. The population density is 39.9 persons per square mile. There are 1,675,562 housing units, a 15.3% increase over 2000. Among them, 90.7% are occupied. Hispanics or Latinos make up 11.7% of the total population. Among those who aren't Hispanic or Latino, 78.5% is "white alone," 1.7% is "black or African American alone," 1.1% is "American Indian or Alaska native alone," 3.6% is "Asian alone," 0.3% is "Native Hawaiian and other Pacific Islander alone," 0.1% is "another race alone," and 2.9% is multiracial. Of the state's total population, 22.6% was under age 18, and 77.4% were 18 or older. The center of population of Oregon is located in Linn County, in the city of Lyons. More than 57% of the state's population lives in the Portland metropolitan area. The largest reported ancestry groups in Oregon are: German (22.5%), English (14.0%), Irish (13.2%), Scandinavian (8.4%) and American (5.0%). Approximately 62% of Oregon residents are wholly or partly of English, Welsh, Irish or Scottish ancestry. Most Oregon counties are inhabited principally by residents of Northwestern-European ancestry. Concentrations of Mexican-Americans are highest in Malheur and Jefferson counties. The largest denominations by number of adherents in 2000 were the Roman Catholic Church with 348,239; the Church of Jesus Christ of Latter-day Saints with 104,312 (144,808 year-end 2007); and the Assemblies of God with 49,357. During much of the 1990s a group of conservative Christians formed the Oregon Citizens Alliance, and unsuccessfully tried to pass legislation to prevent "gay sensitivity training" in public schools and legal benefits for homosexual couples. Oregon also contains the largest community of Russian Old Believers to be found in the United States. The Northwest Tibetan Cultural Association is headquartered in Portland, and the New Age film What the Bleep Do We Know!? was filmed and had its premiere in Portland. There are an estimated 6,000 to 10,000 Muslims in Oregon. The Oregon University System supports seven public universities and one affiliate in the state. The University of Oregon in Eugene is Oregon's flagship liberal arts institution, and was the state's only nationally ranked university by U.S. News & World Report. Oregon State University is located in Corvallis and holds the distinction of being the state's flagship research university with top ranked programs in science, engineering, and agriculture. The university is also the state's highest ranking university/college in a world survey of academic merit. The State's urban Portland State University has Oregon's largest enrollment. The State has three regional universities: Western Oregon University in Monmouth, Southern Oregon University in Ashland, and Eastern Oregon University in La Grande. The Oregon Institute of Technology has its campus in Klamath Falls. The affiliate Oregon Health & Science University (OHSU) comprises a medical, dental, and nursing school in Portland and a science and engineering school in Hillsboro. It rated 2nd among US best medical schools based on research by The Med School 100. Oregon is home to a wide variety of private colleges. The University of Portland and Marylhurst University are Catholic institutions in the Portland area. Reed College, Concordia University, Lewis & Clark College, Multnomah Bible College, Portland Bible College, Warner Pacific College, Cascade College, the National College of Natural Medicine and Western Seminary, a theological graduate school, are also in Portland. Pacific University is in the Portland suburb of Forest Grove. There are also private colleges further south in the Willamette Valley. McMinnville has Linfield College, while nearby Newberg is home to George Fox University. Salem is home to two private schools, Willamette University (the state's oldest, established during the provisional period) and Corban University. Also located near Salem is Mount Angel Seminary, one of America's largest Roman Catholic seminaries. Eugene is home to three private colleges: Northwest Christian University, Eugene Bible College, and Gutenberg College. Oregon is home to two professional sports teams which are both based in Portland: Portland Trail Blazers of the NBA and the Portland Timbers of MLS. Until 2011, the only major professional sports team in Oregon was the Portland Trail Blazers of the National Basketball Association. From the 1970s to the 1990s, the Blazers were one of the most successful teams in the NBA in terms of both win-loss record and attendance. In the early 21st century, the team's popularity declined due to personnel and financial issues, but revived after the departure of controversial players and the acquisition of new players such as Brandon Roy, LaMarcus Aldridge, and Greg Oden. The Blazers play in the Rose Garden in Portland's Lloyd District, which is also home to the Portland Winterhawks of the junior-league Western Hockey League. The Timbers play at Jeld-Wen Field, which is just west of downtown Portland. The Timbers repurposed the formerly multi-use stadium into a football-only configuration in fall 2010, increasing the seating in the process. Portland has had minor league baseball teams in the past, including the Portland Beavers and Portland Rockies, who played most recently at PGE Park. Portland has also actively pursued a Major League Baseball team. It was announced in March 2009 that the Portland Timbers will begin MLS play starting in 2011. The Oregon State Beavers and the University of Oregon Ducks football teams of the Pacific-10 Conference meet annually in the Civil War. Both schools have had recent success in other sports as well: Oregon State won back-to-back college baseball championships in 2006 and 2007, and the University of Oregon won back-to-back NCAA men's cross country championships in 2007 and 2008. Benson raft, a huge sea-going log raft of the early 1900s designed to reliably transport millions of board feet of timber from Oregon / Washington area. ^ Calvin Hall (2007-01-30). "English as Oregon's official language? It could happen". The Oregon Daily Emerald. http://media.www.dailyemerald.com/media/storage/paper859/news/2007/01/30/News/English.As.Oregons.Official.Language.It.Could.Happen-2685082.shtml. Retrieved 2007-05-08. ^ "2010 Resident Population Data: Population Change". US Census. http://2010.census.gov/2010census/data/apportionment-pop-text.php. Retrieved December 21, 2010. ^ "2010 Resident Population Data: Population Density". US Census. http://2010.census.gov/2010census/data/apportionment-dens-text.php. Retrieved December 21, 2010. ^ a b c "Elevations and Distances in the United States". U.S Geological Survey. 29 April 2005. http://erg.usgs.gov/isb/pubs/booklets/elvadist/elvadist.html#Highest. Retrieved November 7, 2006. ^ "U.S. Census Bureau — State & County QuickFacts — Oregon". http://2010.census.gov/2010census/data/index.php. Retrieved 2010-12-21. ^ Loy, Willam G.; Stuart Allan, Aileen R. Buckley, James E. Meacham (2001). Atlas of Oregon. University of Oregon Press. pp. 12–13. ISBN 0-87114-101-9. ^ McLagan, Elizabeth (1980). A Peculiar Paradise. Georgian Press. ISBN 0-96034-082-3. ^ Elliott, T.C. (June 1921). "The Origin of the Name Oregon". Oregon Historical Quarterly XXIII (2): 99–100. ISSN 0030-4727. Retrieved on 11 October 2010. ^ Miller, Joaquin (1904). "Sea of Silence", Sunset, 396(13):5. ^ "Oregon". Merriam-Webster Online Dictionary. http://www.m-w.com/dictionary/oregon. Retrieved 2006-09-14. ^ Oregon Fast Facts. Travel Oregon. ^ Banks, Don (21 April 2002). "Harrington confident about Detroit QB challenge." Sports Illustrated. ^ Bellamy, Ron (6 October 2003). "See no evil, hear no evil". The Register-Guard. http://news.google.com/newspapers?id=MFFWAAAAIBAJ&sjid=qusDAAAAIBAJ&dq=Joey%20Harrington%20scoffs%20at%20criticism%20as%20he%20struggles%20to%20right%20the%20Lions&pg=3329%2C1524986. Retrieved 1 June 2011. ^ United States—States; and Puerto Rico: GCT-PH1-R. Population, Housing Units, Area, and Density. U.S. Census Bureau. Retrieved on March 28, 2008. ^ "Crater Lake National Park". U.S. National Park Service. http://www.nps.gov/crla. Retrieved 2006-11-22. ^ "D River State Recreation Site". Oregon Parks and Recreation Department. http://www.oregonstateparks.org/park_214.php. Retrieved 2007-05-11. ^ "World's Shortest River". Travel Montana. http://montanakids.com/db_engine/presentations/presentation.asp?pid=192. Retrieved 2007-05-11. ^ "Mill Ends Park". Portland Parks and Recreation. http://www.portlandonline.com/parks/finder/index.cfm?PropertyID=265&action=ViewPark. Retrieved 2007-05-11. ^ Beale, Bob (10 April 2003). "Humungous fungus: world's largest organism?" Environment & Nature News, ABC Online. Accessed January 2, 2007. ^ Western States Data Public Land Acreage (13 November 2007). ^ a b "2010 Census Redistricting Data". US Census Bureau. http://factfinder2.census.gov/faces/tableservices/jsf/pages/productview.xhtml?pid=DEC_10_PL_GCTPL2.ST13&prodType=table. Retrieved 2011-03-15. ^ Allen, Cain (2006). "The Oregon History Project- A Pacific Republic". Oregon Historical Society. Retrieved 2010-10-08. ^ Oregon Secretary of State. "A Brief History of the Oregon Territorial Period". State of Oregon. http://arcweb.sos.state.or.us/echoes/history.html. Retrieved 2006-08-09. ^ "Constitution of Oregon (Article V)". Oregon Blue Book. State of Oregon. 2007. http://bluebook.state.or.us/state/constitution/constitution05.htm. Retrieved 2008-03-12. ^ "November 2, 2004, General Election Abstract of Votes: STATE MEASURE NO. 36". Oregon Secretary of State. http://www.sos.state.or.us/elections/nov22004/abstract/m36.pdf. Retrieved 2008-11-17. ^ Bradbury, Bill (November 6, 2007). "Official Results – November 6, 2007 Special Election" (Website). Elections Division. Oregon Secretary of State. http://www.sos.state.or.us/elections/nov62007/. Retrieved December 27, 2008. ^ "November 7, 2006, general election abstracts of votes: state measure no. 39". State of Oregon. http://www.sos.state.or.us/elections/nov72006/results/m39.pdf. Retrieved 12 March 2011. ^ S. Spacek, 2011 American State Litter Scorecard: New Rankings for An Increasingly Environmetally-Concerned Populace. ^ "United States Bankruptcy Court, District of Oregon". U.S. Courts. http://www.orb.uscourts.gov/. Retrieved 2008-12-14. ^ Leip, David. "2008 presidential general election results". Retrieved 2010-10-12. ^ Silver, Nate (May 17, 2008). "Oregon: Swing state or latte-drinking, Prius-driving lesbian commune?". FiveThirtyEight.com. http://www.fivethirtyeight.com/2008/05/oregon-swing-state-or-latte-drinking.html. ^ "State Initiative and Referendum Summary". State Initiative & Referendum Institute at USC. http://www.iandrinstitute.org/statewide_i&r.htm. Retrieved 2006-11-27. 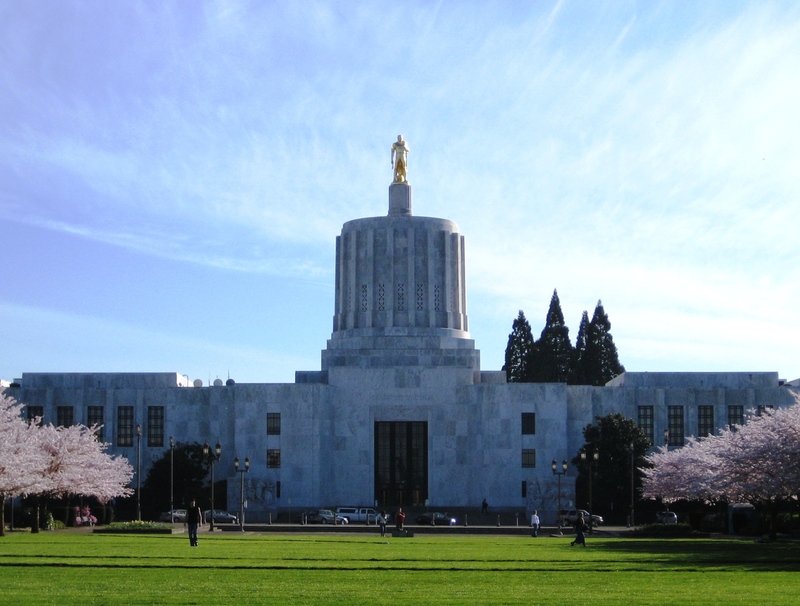 ^ "Eighth Annual Report on Oregon’s Death with Dignity Act" (PDF). Oregon Department of Human Services. March 9, 2006. http://www.oregon.gov/DHS/ph/pas/docs/year8.pdf. Retrieved 2007-06-11. ^ "Voting In Oregon - Vote By Mail." Multnomah County, Oregon. ^ "Gross domestic product by state." Bureau of Economic Analysis. ^ "Industry Facts" (PDF). Oregon Winegrowers Association. http://oregonwine.org/press/StateWineFacts2005.pdf. Retrieved 2006-11-23. ^ "Oregon Forest Facts: 25-Year Harvest History". Oregon Forest Resources Institute. http://www.oregonforests.org/factbook/Harvest_History(24).html. Retrieved 2007-03-07. ^ "Forest Economics and Employment". Oregon Forest Resources Institute. http://www.oregonforests.org/factbook/economics(29_30).html. Retrieved 2007-03-08. ^ "Oregon economy". e-ReferenceDesk. Retrieved 2010-11-05. ^ Don Hamilton (2002-07-19). "Matt Groening’s Portland". The Portland Tribune. http://portlandtribune.com/news/story.php?story_id=12392. Retrieved 2007-03-07. ^ "Bright spots amid the turmoil". The Oregonian. January 1, 2008. p. D3. http://www.oregonlive.com/business/oregonian/index.ssf?/base/business/1199161505105830.xml&coll=7. Retrieved 2007-01-01. ^ Rogoway, Mike (January 15, 2009). "Intel profits slide, company uncertain about outlook". The Oregonian. http://www.oregonlive.com/business/index.ssf/2009/01/intel_profits_slide_company_un.html. Retrieved 2009-01-16. ^ "Genentech Selects Hillsboro". Hillsboro Chamber of Commerce. http://www.hillchamber.org/memberservices/in_the_news.asp#Genentech. Retrieved 2007-03-21. ^ "Oregon's Beer Week gets under way.". Knight-Ridder Tribune News Service. 2005-07-05. http://goliath.ecnext.com/coms2/gi_0198-242714/Oregon-s-Beer-Week-gets.html. Retrieved 2007-10-22. ^ Moore, Adam S.; Beck, Byron (November 8, 2004). "Bump and grind". Willamette Week. http://www.wweek.com/story.php?story=6093. Retrieved 2007-02-01. ^ "Gross Domestic Product (GDP) by State, 2006". Bureau of Economic Analysis — U.S. Department of Commerce. http://www.bea.gov/newsreleases/regional/gdp_state/gsp_newsrelease.htm. Retrieved 2007-06-10. ^ Rogoway, Mike. "Oregon's largest private employer". The Oregonian. http://blog.oregonlive.com/siliconforest/2009/01/oregons_largest_private_employ.html. Retrieved 2011-01-25. ^ "Government Finance: State Government". Oregon Blue Book. http://bluebook.state.or.us/state/govtfinance/govtfinance01.htm. Retrieved 2007-06-20. ^ Har, Janie (2007-06-20). "Your loss is state's record game". The Oregonian. http://0-docs.newsbank.com.catalog.multcolib.org/openurl?ctx_ver=z39.88-2004&rft_id=info:sid/iw.newsbank.com:NewsBank:ORGB&rft_val_format=info:ofi/fmt:kev:mtx:ctx&rft_dat=119E94A840D2FBB8&svc_dat=InfoWeb:aggregated4&req_dat=0D10F2CADB4B24C0. Retrieved 2007-06-20. ^ "State Sales Tax Rates". Federation of Tax Administrators. 2008-01-01. http://www.taxadmin.org/FTA/rate/sales.html. Retrieved 2008-04-02. ^ "25th Anniversary Issue: 1993". Willamette Week. http://www.wweek.com/html/25-1993.html. Retrieved 2007-06-11. ^ "Initiative, Referendum and Recall: 1988–1995". Oregon Blue Book. State of Oregon. http://bluebook.state.or.us/state/elections/elections21.htm. Retrieved 2007-06-11. ^ Sheketoff, Charles (2007-03-27). "As Maryland Goes, So Should Oregon". Salem News. http://salem-news.com/articles/march272007/oregon_mrlnd_32707.php. Retrieved 2007-06-10. ^ a b "Oregon ranks 41st in taxes per capita". Portland Business Journal. 2006-03-31. http://www.bizjournals.com/portland/stories/2006/03/27/daily28.html. Retrieved 2007-06-10. ^ "Food and Beverage Tax". City of Ashland. http://www.ashland.or.us/Page.asp?NavID=9180. Retrieved 2007-06-10. ^ "Oregon's 2% Kicker" (PDF). Oregon State Leglislative Review Office. http://www.leg.state.or.us/comm/lro/rr02-07.pdf. Retrieved 2007-06-10. ^ Cain, Brad (March 2, 2006). "Kicker tax rebate eyed to help school and state budgets". KATU.com. http://www.katu.com/news/3617476.html. Retrieved 2006-06-10. ^ "2 Percent Surplus Refund (Kicker) History" (PDF). State of Oregon. http://www.oregon.gov/DOR/NEWS/docs/kicker.pdf. Retrieved 2007-06-10. ^ Cooper, Matt (2007-03-09). "County may scrub income tax". The Register-Guard. http://www2.registerguard.com/cms/index.php/static/search/archive/?q=County+may+scrub+income+tax. Retrieved 2007-03-09. ^ "2006 Oregon full-year resident tax form instructions." Oregon.Gov. ^ a b "Oregon". Resident Population and Apportionment of the U.S. House of Representatives. U.S. Census Bureau. December 27, 2000. http://www.census.gov/dmd/www/resapport/states/oregon.pdf. Retrieved 2009-08-28. ^ "Annual Population Estimates". Portland State University Population Research Center. http://www.pdx.edu/prc/annualorpopulation.html. Retrieved 2008-03-03. ^ "2010 census profiles: Oregon and its counties". Portland State University Population Research Center. http://www.pdx.edu/sites/www.pdx.edu.prc/files/media_assets/2010_PL94_counties_updated.pdf. Retrieved 15 May 2011. ^ "Population and Population Centers by State: 2000". U.S. Census Bureau. http://www.census.gov/geo/www/cenpop/statecenters.txt. Retrieved 2006-11-23. ^ "JULY 1, 2006 Population estimates for Metropolitan Combined Statistical Areas" (csv). U.S. Census Bureau. Archived from the original on 2007-09-20. http://web.archive.org/web/20070920212740/http://www.census.gov/population/www/estimates/metro_general/2006/CBSA-EST2006-01.csv. Retrieved 2007-10-19. ^ "2006-2008 American Community Survey 3-year estimates." U.S. Census Bureau. ^ United States Census Bureau (2005-04-21). "Interim Projections of the Total Population for the United States and States: April 1, 2000 to July 1, 2030". http://www.census.gov/population/projections/SummaryTabA1.pdf. Retrieved 2010-08-18. ^ Office of Economic Analysis (April 2004). "State and County Population Forecasts and Components of Change, 2000 to 2040". Oregon Department of Administrative Services. http://www.oregon.gov/DAS/OEA/docs/demographic/pop_components.xls. Retrieved 2010-08-25. ^ "U.S. Religious Landscape Survey." The Pew Forum on Religion & Public Life. Retrieved 2010-02-05. ^ "State membership report- Oregon." The Association of Religion Data Archives. ^ Newport, Frank (7 August 2009). "Religious identity: States differ widely." Gallup. Retrieved 2009-12-23. ^ Kosmin, Barry A.; Keysar, Ariela. "American Religious Identification Survey." Hartford: Trinity College. Retrieved 2009-12-23. ^ Kosmin, Barry A.; Keysar, Ariela with Cragun, Ryan; Navarro-Rivera, Juhem. "American nones: The profile of the no religion population." Hartford: Trinity College. Retrieved 2009-12-23. ^ Wentz, Patty (11 February 1998). "He’s back." Willamette Week. Retrieved on March 14, 2008. ^ a b "Oregon Blue Book: Oregon Almanac: Native Americans to shoes, oldest." Oregon Secretary of State. Retrieved on March 28, 2008. ^ "Oregon public school enrollment increases during 2007-08." Oregon Department of Education. Retrieved on March 28, 2008. ^ Wood, Shelby Oppel (2006-05-01). "UO weighs new diversity plan amid simmering racial tensions". The Oregonian. http://www.oregonlive.com/search/oregonian/. ^ "Higher education get higher priority." The Oregon Daily Emerald, 29 June 2007. Retrieved 2007-07-08. ^ a b "MLS awards team to Portland for 2011." Portland Timbers, 20 March 2009. ^ Smith, Sam (October 18, 2006). "Blazers stalled until bad apples go". MSNBC.com. http://www.msnbc.msn.com/id/15321476/. Retrieved 2008-01-15. ^ Mejia, Tony (October 13, 2007). "Oden's loss hurts, but team in good hands". CBSNews.com. http://www.cbsnews.com/stories/sportsline/main10406427.shtml. Retrieved 2008-01-15. ^ "Rose Quarter Venues". RoseQuarter.com. http://www.rosequarter.com/RoseQuarter/Venues/tabid/84/Default.aspx. Retrieved 2008-01-15. ^ "PGE Park Teams and Events". PGEPark.com. http://www.pgepark.com/stadium/events/. Retrieved 2008-01-15. ^ "Oregon Stadium Campaign". Oregon Stadium Campaign. http://www.oregonstadiumcampaign.com/. Retrieved 2008-01-14. ^ "Northwest League." Minor League Baseball. Retrieved 2008-01-15. ^ "International Basketball League." International Basketball League. Retrieved 2008-01-15. ^ Beseda, Jim (12 August 2010). "Oregon State baseball: Coach Pat Casey praises ex-Beaver Darwin Barney". The Oregonian (Portland, Oregon). Retrieved 2010-10-08. ^ The Associated Press (8 January 2009). "Oregon men, Washington women win titles". ESPN. Retrieved 2010-10-08. ^ a b c d Van Winkle, Teresa (June 2008). "Background brief on international trade." State of Oregon. Retrieved 2008-07-21. ^ a b "Governor's mission to Asia will stress trade and cultural ties." Oregon Secretary of State, 24 October 1995. Retrieved 2008-04-02. This page uses content from the English language Wikipedia. The original content was at Oregon. The list of authors can be seen in the page history. As with this Familypedia wiki, the content of Wikipedia is available under the Creative Commons License.